Following weeks of eager anticipation, Ces Cru has released the official “Thanatos” music video. The Kansas City duo stars in this great video, which follows them around their stomping grounds and during their opening performance at a Tech N9ne show. 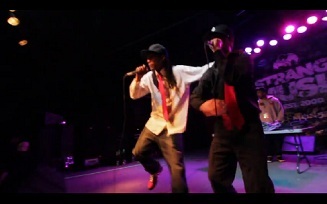 Fans may recognize Ces Cru from their work on “Livin Like I’m Dyin” from Tech N9ne’s Bad Season. The mesmerizing hook and mellow production make for an incredibly unique track, something Ces Cru has become synonymous with. No Kansas City video would be complete without Tech N9ne though. The King Of Darkness makes a few cameo appearances throughout the video. With Ces Cru once again stepping up to the plate, Kansas City gets a little brighter. Fans can look forward to hearing Ces Cru again on Tech N9ne’s All 6’s And 7’s.